Shep Associates was formed 12 Years ago, by Derek G Stoddart, who was one of the original five Neve engineers working for Mr. Rupert Neve at his house in the UK. 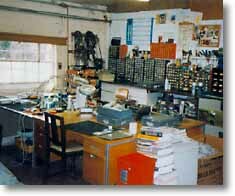 After Leaving Neve back in 1976, Derek Stoddart went to run the Mincom Division of 3M company, as Technical Manager. The division handled support for Analogue M79 Multitrack tape machines, Video character generators and large switching systems and also Video mixers and effects. It supplied the Worlds first commercial Digital Multitrack recorders and editing system, in conjunction with the BBC. Shep Associates was formed mainly as Derek was receiving an increasing number of requests for him to carry out modifications to Neve consoles and no one was doing that. Most of the Staff are ex-Neve so we have a wealth of experience of old Neve consoles. 1073 3 band Equalisers and Shep did a modification to convert these Equalisers to 4 band by adding as fully switched HF band and an additional overlapping Presence band. This type of module was very labour intensive to build so a new version was designed using a single PCB to cut down wiring and assembly times. This differs from the old Neve designs and is actually an improvement over the originals (Clients words not ours). All the Shep modules are fully discrete and hand built to very high Standards, using original style components where available. "After trying to source some original Neve units I decided to purchase Shep 31105 types equalisers, because old Neve units tend to need new switches and capacitors etc. So I thought it best to buy a new unit. I find the Shep units work well with Bass and Drums".